Friday, June 17, 1859.Springfield, IL. In the U.S. 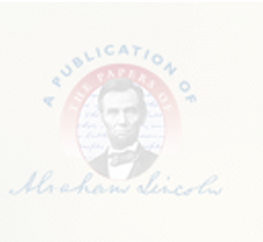 Circuit Court case of Lee, Murphy & Avery v. Adams, Lincoln files a declaration for the plaintiffs, of New York. Illinois resident Joseph H. Adams purchased $3,461.32, worth of goods, including fur hats, gloves, and capes from the plaintiffs. The plaintiffs are suing Adams, who "although often requested so to do . . . has not as yet paid the said sum of money, or any part thereof, but so to do has hitherto wholly neglected and refused, and still does neglect and refuse [to pay]." The plaintiffs seek $5,000, in damages. Declaration, filed 17 June 1859, Lee, Murphy, & Avery v. Adams, case file 717, Record Group 21, National Archives and Records Administration, Great Lakes Region, Chicago, IL. In two other cases, Rice v. Wing, and Whiting v. Mudge, Lincoln, Logan, and Gillespie enter motion for rule on plaintiffs to join in demurrer by June 21, 1859. Files; Record. Robert buys 11 pounds of sugar at Smith's. Pratt, Personal Finances, 157.